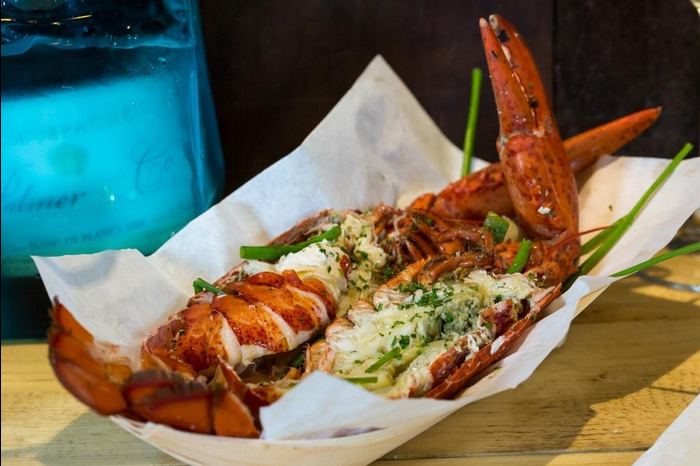 Situated a 5 minute walk from Tottenham Court Road, Lobster Kitchen is in a perfect location to attract London regulars from the trendy Soho business area nearby and stumbling tourists laden down with shopping bags from Oxford Street. The Lobster Kitchen could aptly be named shack; it is authentic with décor being shipped from New England, a slate wall from Canada and a further wall commissioned by London artist Tilo Kaiser, utilising old Canadian newspapers. Everything is quaint, kitsch and works incredibly well. After an initial discussion over dinner in 2013, co-owners Abigail Tan and Valeria Cinaglia opened the doors to LK on the 22nd of October 2014 and have had a great start to the business establishing itself in its first few months trading. As a lover of seafood, I was delighted to be invited to the press opening. Upon arrival we were greeted with a prosecco and elderflower cocktail, quickly followed by a crisp, cold glass of Palmer & Co Blanc De Blancs, which Hannah and I stuck to for the rest of the evening. We have had one too many post blogging hangovers of late and, although this morning I am not thinking it, we do actually want to remain employed. The delightful food started with Lobster Bisque, which was light, well seasoned, and a well received source of warmth. We then were treated to delightful sweet brioche with garlic and chilli lobster. This was delicious. The lobster was fresh, firm and meaty and the spice complimented the sweetness of the brioche to a tee. The second mini roll served was seasoned with garlic and lemon, it was lighter and would be better suited to a more delicate palate. I added hot sauce, which probably doesn’t mean much, from living in Bangkok; I now add hot sauce to toast. The final Brioche was a bacon, broccoli and lobster roll. It works, its big in New England, don’t ask anything more. We then had sweet potato and garlic chips coupled with macaroni cheese with lobster. The macaroni cheese was my favourite. It was well seasoned, had huge chunks of lobster and you could taste the different strength of cheeses used. We left happy, screechy from too much wine and much too full to fulfil our plan of going to Topshop to find dresses for going out on Friday. I would call that a success. The team are lovely, the place is homely and you truly want Valeria and Abigail to be a success. I would recommend nipping down for sharing bites and a bottle of wine on a casual evening with good friends.